I don’t know where you are from, but I live in Iowa. If ever need to know ANYTHING about this state (and the surrounding midwest states) it will be that we have COLD WINTERS. I am not talking cold like 30 degrees, I am talking 30 below WITH A WINDCHILL… If you don’t know what a windchill is, I envy you. Anyway, even though our winters are cheek-numbing and frostbiting, those of us that have dogs need to be outside constantly throughout the day. Its awful- but that is the price we pay for loving our canine companions! So, in honor of the zero degree temperature that I am currently living in, I wanted to write about how we as dog lovers can keep them safe during the cold winter months! *Firstly, You should never leave your dogs outside unsupervised unless he/she has access to a heated building. A DOG HOUSE WILL NOT CUT IT. Just because your dog has fur, it does not mean he can withstand the cold. I know, some breeds (like Huskies, Samoyeds and Malamutes) are better suited to cold weather, but every dog deserves access to a warm shelter at all times. If you are the type of person that keeps your dog outside at all times, it is imperative that they have access to your garage or some other type of heated shelter. Something that works great is a heated dog bowl. It keeps the water at a nice temperature and it will never freeze! *Small dogs or those with little (to no) hair should wear sweaters or jackets for protection against the cold. I know, I think they look goofy too, but they really can’t handle it! Breeds that I think would benefit from this are Chihuahuas. Miniature Pinschers, Great Danes and Greyhounds. Not all dogs will wear clothes, I understand this. But at least try to remember to limit their time outside (if you can help it!) Small, frequent potty breaks work the best in the cold! Puppies also can’t deal with cold as well. They will be difficult to housebreak when it is cold (and snowy!!). Opt to train them on pads inside, or limit their time outside and be understanding if there are accidents. *Make sure to take extra care of their feet! If your dog will tolerate it (mine absolutely will not under any circumstances! ), consider foot protection, like dog shoes or booties. The salt that is put down on sidewalks is very harmful to the dog’s pads. If your dog can’t stand shoes, then after your walks be sure to wash the bottom of their paws and stomachs! If salt is left it can start eating away at their pads and it can be very painful! 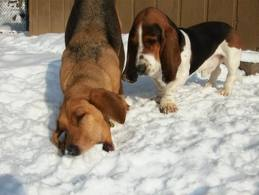 There are pet-friendly (salt free and chloride free) ice melters such as Morton® Safe-T-Pet®! *Be careful around ice! (The dog shoes will help with this too.) Walking on ice is very dangerous to both you and the dog (obviously). If they pull too hard, you will slip and fall. If THEY slip and fall, however, it can mean broken hips, broken legs, and expensive vet bills. Take extra care with the senior pets! They are obviously more fragile. * This one is hard for me but try to deter them from eating snow! You have absolutely no idea what is underneath and it can be deadly for them. 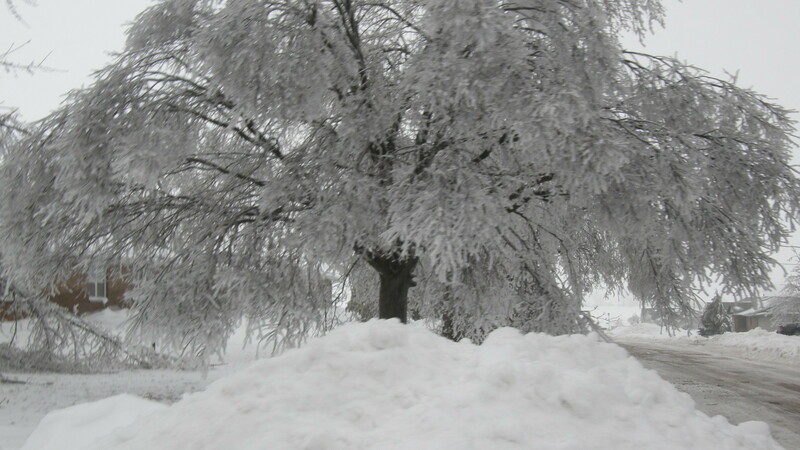 One very dangerous thing that lurks underneath snow is antifreeze! This is absolutely deadly, even a small amount- but very sweet which makes it hard for dogs to resist. If you even suspect that your dog has come in contact with antifreeze, CALL YOUR VET RIGHT AWAY! *Feed your dog more during the winter if they enjoy being outside! This helps them put on the weight they need to keep warm! *Make sure that your dog is microchipped or at least has tags! If they are lost in the snow, you want them to be found as quickly as possible! *Also, during the winter months my heart always aches for the stray animals. Firstly, if you see one PLEASE catch it and call your local shelter. This is life and death for them. Every single person I know would do it for a child- an animal isn’t any different. *Don’t forget to knock on the hood of your car before you start it EACH TIME! You never know what little critter tried to keep warm by your engine. If you are a true animal lover, like I am, be sure to check the “warm spots” this winter. I am talking about warm hoods, laundry exhaust vents, garages, or anything else that can give off heat. Cats and other stray animals try to find shelter in these areas, and it can be very dangerous for them. What I have done (pictured below) is made a few of these enclosures to help keep the stray animals safe. 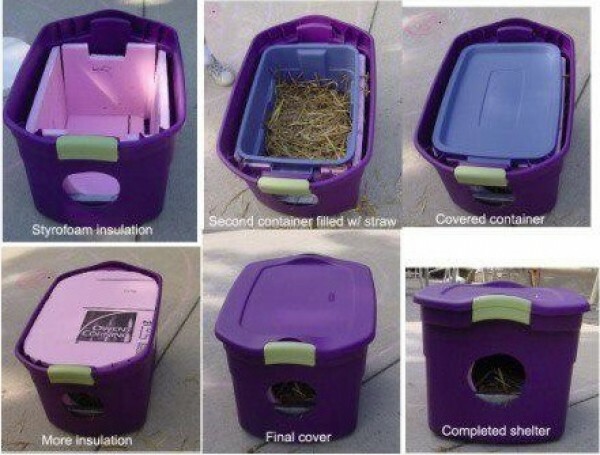 It is a cheap way to help all of the animals in your neighborhood… I strongly suggest that everyone who has a yard (especially those of you with farms) to make a few of these 🙂 You don’t necessarily need the second tub in the middle either. Also, if you see a dog that is constantly left outside DO NOT hesitate to call your local animal shelter or animal control. The animal deserves better and it is up to you to help! If you don’t know who to contact, leave a comment and I will find the information for you! Thank you for reading! Please share this and let’s keep our pets safe this winter!